Having been up most the night and up early for the start of my day I was brainstorming ways to keep the kiddos occupied today that wouldn't require too much work on my end. I anticipated Evan feeling pretty miserable and wanting to sit on the couch watching movies all day; especially once I removed the bandage from his stitches and cleaned it out, but I wanted the boys to have fun things to look forward to doing today (not just watching!). Ian did inform me that he'd like to play outside today and I readily agreed. He just goes stir crazy inside anyway. Evan, however, did NOT want to go outside at all. Ever again! Hopefully, as he heals the EVER part will start to fade away. 1. Shaving cream or foam-- my kids ALWAYS love to play with shaving cream and I thought they might like to make foam. It was fun to watch too! We used 1/3 cup water and a squirt of dish soap (we kept our foam white) and we put the blender on high until the foam was all the way to the top. I put it on trays for them to play with and for the most part they all pretended it was snow. It melts like snow and it's fluffy, so why not? Best part for mom? The cleaning up isn't bad since it's just a bit of soap and water! 2. Pattern/shape blocks-- I know my kids like to spend time arranging and building and just playing freely with the shape blocks. As soon as I pulled them out they all were saying "wow!" and "I love those, I used to play with them every day at school!" They immediately sat down and started creating! For an hour! They built, rearranged, made patterns, played with shapes and colors. It was wonderful! They were so creative too! Alec made a lion, Evan made a race car and a Wobat, Ian made huge arrangements! one of Ian's many masterpieces. 3. 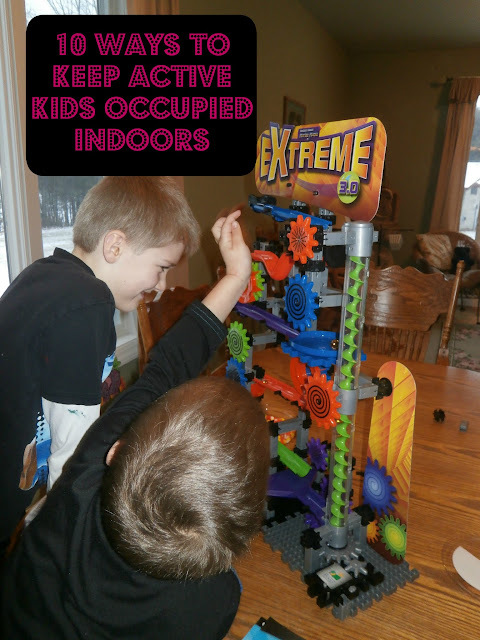 Paper plate/ marble mazes-- I have been dying to try this with the boys! But we discovered we had the "wrong" paper plates so we'll have to save this idea for another day. Perhaps I'll have them try to make a marble maze using paper towel and toilet paper rolls instead; those I have! 4. Make Flubber-- here is the recipe (though there is a lot of controversy over the addition of borax so use your judgement). We found it to be just like a silly putty that we make with liquid starch and Elmer's glue but they had fun cutting it, molding it, scooping it with trucks, etc. Another hour of our day gone! We saved them in disposable Tupperware bins for another day. We had extra liquid left in the container after it set up so I just poured it out. 5. Blowing a pom pom along a line of tape using a straw-- don't underestimate this one I bet it would be great fun and challenging for all ages. You can tape as many lines as you need, make them criss cross, double around, curve, zig zag, etc. Make it a race! Or turn it into science by encouraging them to try using small and large pom poms, larger or smaller straws, one hand or two! The possibilities seem endless. 6. Paper plate and balloon ping pong-- glue or tape a large Popsicle stick to a paper plate, inflate a balloon (or two) and have your kids try batting it around. They can pass it, see who can keep their balloon in the air the longest, etc. Balloons are always engaging in this house so I think they'd really enjoy this! 7. Building challenge-- this could be with Lego's, blocks, dominoes, cardboard, etc. I wanted to come up with something for them to build-- the tallest tower, the strongest bridge, an arc, a pyramid, etc. I asked the boys if they wanted to make their own cars out of cardboard boxes for a "drive- in" movie one night but we'll need to round up some special supplies for that. 8. Make a house out of a deck of cards-- I was a huge Brady Bunch fan as a kid and I always remember that episode where the boys and the girls had a challenge going to see who could make the largest house of cards. It looked like fun and I thought the boys were old enough to try patiently. 9. Make a special snack-- we choose s'mores made in the microwave. I liked this because I won't be tempted to eat them (I don't like marshmallows). The boys thought this was great. They love a messy, gooey snack, I mean who doesn't right? 10. Nerf gun shooting range-- I saw this and just couldn't resist adding it to our list. The mix of star wars Lego's & Nerf guns was sure to be a huge hit in this house! We often draw a bulls eye on one of our large windows using dry erase markers and have contests to see who can get the most points so this would be a fun variation of that. I knew we wouldn't get to everything on the list today, but the boys did watch two more Disney Imagineering movies, played some Chess on the Kindle, played Words with Friends, and just hung out watching movies, playing computer games, etc.